Woodford, Chris and Luke Collins, Clint Witchalls, Ben Morgan, James Flint. Cool Stuff and How it Works. 256 p. DK Publishing. 2005. 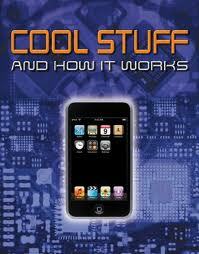 ISBN 978-0-7566-5834-2.Whether you are a boy or girl, tech savvy or not, Cool Stuff and How It Works is a really cool book (no pun intended!). Are you the kind of person who wants to know why things do what they do? Do you wonder how things work? Have you ever taken something apart, just to see what was inside? If so, this book is for you! Even if you aren’t a really techie person, this book will still fascinate you! Ever wondered how an electric guitar works? How do fireworks work? What about a jet engine? All of these and more are in this book that explains how really cool stuff works and what it does. Over 85 really cool items are discussed. From fire suits to batteries to elevators, this book has it all! It is full of pictures and detailed diagrams as well as short sections on each item, this book explains how each cool thing works and what it does. So if you want to know how something works, or want to be able to tell someone else how something works, check out Cool Stuff and How It Works. This entry was posted in booktalks, Nonfiction and tagged inventions, technology. Bookmark the permalink.